Butternut squash have only about two-thirds the calories, pound per pound, as potatoes, but otherwise they're relatively similar in the macronutrient category. Protein makes up 9 to 10% of the calories, and the rest of the calories come primarily from sugars and starches. Despite what I read in Gardening for Maximum Nutrition, though, the USDA Nutrient Database shows butternuts trumping white potatoes in three-quarters of the vitamins and minerals measured. If you're going to eat a vegetable that's primarily starch, butternut isn't a bad choice. Plus, we just plain love them. So when Mark came home with 97 butternuts, I was thrilled. The same friend who sold him 35 butternuts for 20 bucks in the middle of August was now looking to unload the rest of his harvest, this time with no money changing hands. I guess that people at farmers markets in late fall feel about the same way about butternuts as they do about zucchini in August (although I can't imagine not wanting to eat all of those butternuts myself.) Mark finally felt that we had enough butternuts on hand that I could make a batch of butternut squash and Egyptian onion soup to go along with our butternut squash pie --- scrumptious! Thanks, Dennis! Oooo, ooo, I want some!! Share!!! Good grief!!! 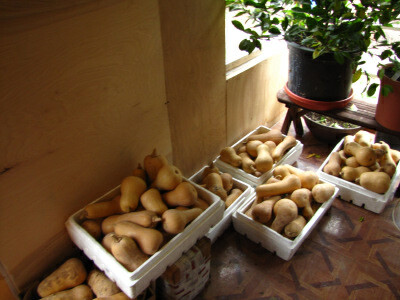 That is one army of butternuts! 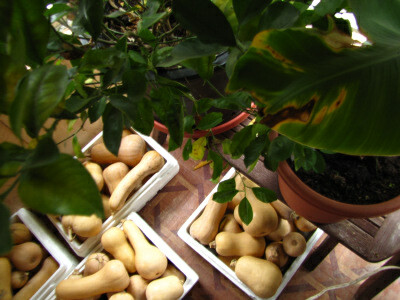 Around here I love that they (C. moschata) are the only squash that doesn't have a problem with squash vine borer moth. I didn't grow THAT many, though! Jenny-fur --- Your dozen are just waiting for you to come pick them up. Eliza --- We have terrible vine borer problems, so I think it's pure luck that the tastiest winter squash is also the most resistant one. They're also in a different species from nearly every other type of winter squash, so you can save the seeds without worrying.